Purple Carrot is a plant-based, all vegan meal kit delivery service, that is designed not only for vegans but for those who enjoy plant-based eating Their vision is to help the world become a place where plant-based eating is a mainstream choice. 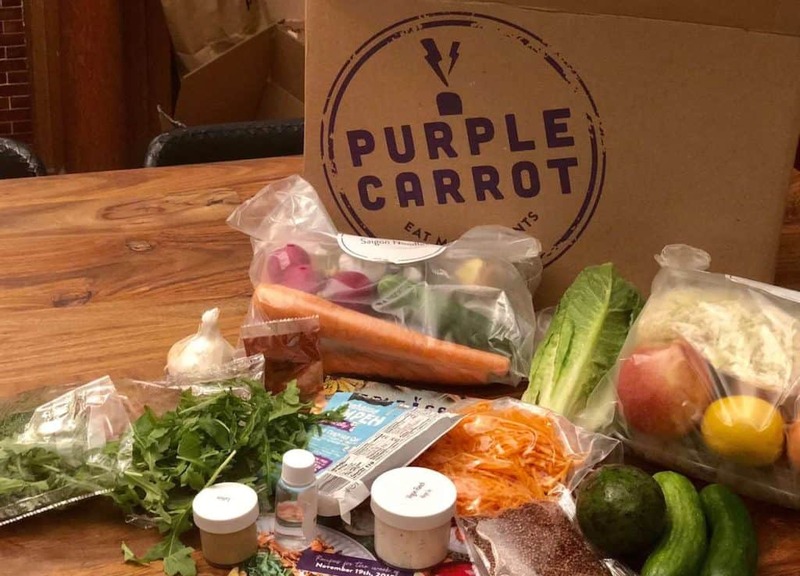 Purple Carrot is a plant-based, all vegan meal kit delivery service, that delivers to the contiguous 48 states. Their vision is a world where plant-based eating is the norm and that this choice is made to improve health, our environment, and animal welfare. In each delivery, you will receive fresh and pre-portioned plant-based ingredients that will allow you to prepare delicious dinners in the comfort of your home. The Purple Carrot meals are designed to be hassle-free, so all you will need to do is heat up the stove, chop up some veggies and cook your dinner. We found the Purple Carrots dishes interesting and tasty, but we did have some issues with the quality of some of their ingredients. As a result, we recommend checking out other vegan alternatives that we think offer a superior service. Purple Carrot is designed for those who follow a 100% vegan diet in addition to people who have the desire to include more plant-based foods in their weekly menu. Their special TB12 plan is also suitable for physically active people with established exercise routines, who wish to live on a high-protein diet. Plant-based food that is not limited to vegans but also to those who wish to increase their plant intake. Purple Carrot offers three plans that are all designed for two people and provide three meals per week. Once you sign up to Purple Carrot, you can swap meals in your weekly deliveries, regardless of your plan. High Protein – protein-packed meals, designed to provide maximum energy. Chef’s choice – gourmet plant-based dishes, crafted to provide upscale dining options for your evening meals. The company also offer a special TB12 Performance Plan which is designed for anyone who is looking to achieve and/or sustain their peak performance. The TB12 recipes are high in protein, and are gluten-free and low-soy and designed to help fuel the higher metabolic needs of active individuals. As mentioned, all the Purple Carrot ingredients are 100% plant based, suitable for those who follow a vegan diet, but they are also perfect for non-vegans who would like to increase their intake of plant-based ingredients. Purple Carrot has a diverse menu that includes American, Mexican, Mediterranean, Italian, and Asian cuisines and many more. You can explore future weekly menus at the “Menu” tab located at the top bar of the website. 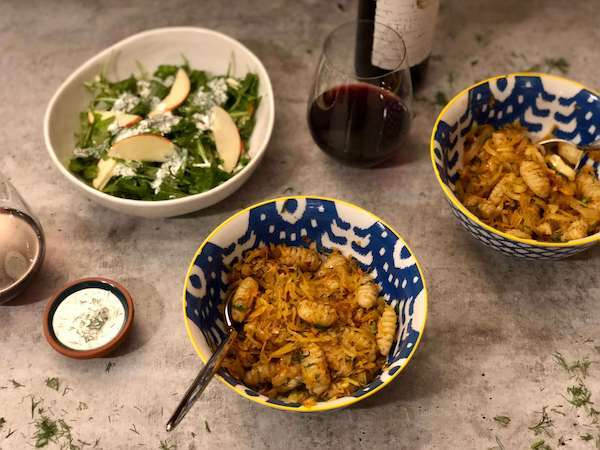 Our team of experts at the Meal Kit Review always try out each company we review, which involves tasting a range of items from the company’s menu. We thought the Purple Carrot food was tasty (even the non-vegans enjoyed it) and the recipes were interesting. We did find, however, that some of the ingredients were not in the best shape and needed to be replaced. Two dishes we enjoyed were – the California Wedge Salad and the Gnocchi. The salad was filled with fresh vegetables – lettuce, carrots and cucumbers, and plant-based proteins – red quinoa and tempeh. The tahini sauce and the smoked paprika seasoning gave the dish a real flavor boost! As for the Gnocchi, it was delicious, interesting and enjoyable to eat. Dill and cabbage are both items that we would never have thought of pairing with pasta, but the combination was very good. The quality of ingredients we received in the Purple Carrot box was a little inconsistent. Some of the ingredients like the romaine lettuce, radishes, and carrots were super fresh and of an excellent quality, but others were somewhat disappointing. We received cucumbers for two dishes, and after two days in the fridge, they were mushy and inedible. The avocado we received for the California Wedge Salad was hard and not able to be used. In both cases, we needed to supplement the items with self-bought grocery store items. We also found it odd that there is no mention on the Purple Carrot website as to the source and quality of their ingredients. Are their ingredients sourced locally from trusted suppliers? Organic? Non-GMO? Free of preservatives? We would prefer that more information is made available regarding the quality of ingredients, especially from a plant-based service. Due to these discrepancies, we do recommend checking alternate vegan plans available in other meal kit services that are able to provide detailed information on where their ingredients come from and ingredients that are of a consistently high quality. The Purple Carrot delivery arrives in a medium size branded and labeled carton box. What is lovely about the Purple Carrot delivery is that everything is labeled and beautifully organized inside. It is very clear which ingredients go with each dish and there is minimum sorting required. The walls of the box are covered with insulating material, and at the bottom of the box, there is a big non-toxic gel ice pack included to keep everything cool during the delivery process. The Purple Carrot box can easily stay outside of the fridge for a few hours after delivery without requiring refrigeration. As a plant-based company, Purple Carrot adheres to high standards of environmental responsibility, and that is why most of their packaging is reusable, recyclable, biodegradable, or compostable. Getting started with your first order at the Purple Carrot is easy. You simply sign up to the service via their website. First, you enter an email and password, choose your preferred plan and create the account. The last step is to go over your menu selection and choose your meals. There are four meal plans to work with, and there are eight to nine recipes to choose from on a weekly basis. There are three for the TB12 and six for the other three plans. Meal choices include options that are gluten-free, high in protein and easy to prepare. Your account is easily managed online, and there are also the flexible options available of skipping weeks if needed, swapping recipes, and changing you plan from week to week. You can also cancel your subscription via the online account setting at any time. There is no doubt that Purple Carrot makes plant-based food accessible and attractive. Their menu offers a nice variety of meals, including many high-protein meals. The meals we tasted from the Purple Carrot selection were great and full of interesting flavors, but we did have some issues with their ingredients, and unfortunately, we could not say that all ingredients supplied were of the highest quality. If you are looking for a plant-based meal delivery service, we recommend looking at our ’Best Meal Kits for the Vegan Diet’ and checking out all the available options for your plant-based needs.